Last week, we blogged about our unsuccessful Willy Wonka-esque attempt to get into the FY2010 budget “mark-up” of the House Appropriations Subcommittee on State, Foreign Operations, and Related Programs to see if there was any discussion about conditioning President Obama’s budget request for $2.775 billion in military aid to Israel. Yesterday, we tried again at the full committee level. We lined up one hour before the “mark-up” began in the hopes of delivering to Rep. David Obey, the Chair of the House Appropriations Committee, an open letter signed by more than 200 organizations calling on his committee to cut off or, at the minimum, condition military aid to Israel. We also had hoped to deliver to him the names of more than 5,000 people who sent him individual letters with the same demand and more than 750 signed pages of petitions to the same effect. We shot this video after waiting unsuccessfully for two hours to get into the meeting to give people a sense of how opaque the budget process is on Capitol Hill. Thanks to Gael Murphy of Code Pink for the background signs. Enjoy! How silly of the US Campaign to think that Congress actually still believed in the 1st Amendment, which forbids it from abridging the right of the people to “petition the Government for a redress of grievances.” How exactly do the people petition Members of Congress when they won’t even let the public into the room? A select few members of the public actually did get into the “mark-up” eventually. 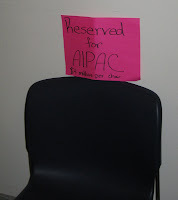 We found this sign attached above one of the chairs of the lucky few allowed in. Democracy in action again! Oh yeah, by the way, the House Appropriations Committee voted to recommend $2.775 billion in military aid for Israel in FY2010 without any discussion or debate.